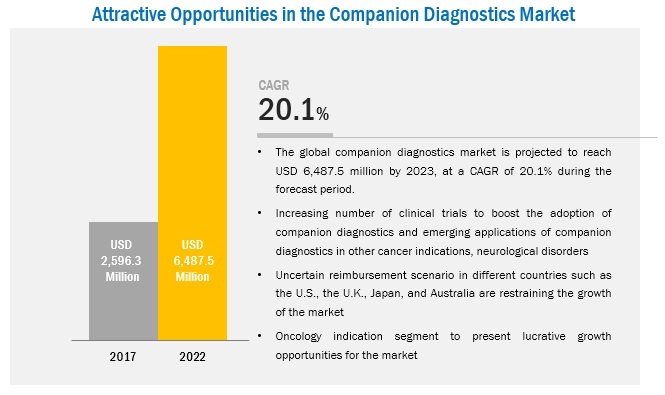 [170 Pages Report] The global companion diagnostics market is expected to reach USD 6.51 billion by 2022 from USD 2.17 billion in 2016, at a CAGR of 20.1%. A companion diagnostic assay is an in vitro diagnostic device (IVD) that is used to identify whether a patient with certain diseases could be benefitted by a particular drug through the biomarker assessment. The key factors driving the growth of this market include the increasing lung cancer cases, growing number of genetic testing, rising need for personalized medicines, and regulatory guidelines that support the companion diagnostics market. The base year considered for the study is 2016, and the forecast has been provided for the period between 2017 and 2022. Owing to the advantages of companion diagnostics in drug approval processes, an increasing number of pharmaceutical companies have entered into partnerships and collaborations with different companion diagnostic companies to develop and commercialize companion diagnostics tests for their drugs. For instance, in 2016, Agilent Technologies, Inc. and Applied Spectral Imaging (ASI) entered into a marketing agreement. ASI's most advanced GenASIs imaging platforms and Agilent's fluorescence in situ hybridization (FISH) products and solutions will be marketed by them. Simalarly in 2016, QIAGEN collaborated with Array BioPharma to develop and commercialize a companion diagnostic test. The test will be developed for Array BioPharma's binimetinib, an MEK inhibitior. 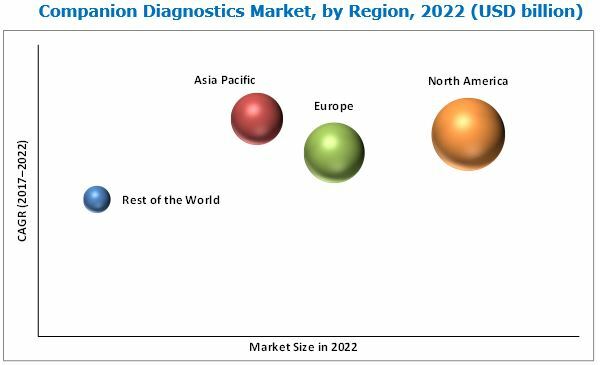 The prominent players in the global companion diagnostics market are Roche Diagnostics (Switzerland), Agilent Technologies, Inc. (U.S.), QIAGEN N.V. (Netherlands), and Abbott Laboratories Inc. (U.S.). In 2016, QIAGEN partnered with Mirati Therapeutics, Inc. to develop and commercialize companion diagnostic tests for Mirati’s non-small cell lung cancer therapy glesatinib. In 2016, Roche received FDA approval for its VENTANA ALK (D5F3) to use with XALKORI (crizotinib) drug in patients with ALK-positive lung cancer. In 2016, Agilent Technologies, Inc. and Applied Spectral Imaging (ASI) entered into a marketing agreement. ASI's most advanced GenASIs imaging platforms and Agilent's fluorescence in situ hybridization (FISH) products and solutions will be marketed by them. *Other technologies include multiplex assay and imaging technology. The growth of this market is majorly driven by the factors such as improvements in regulatory guidelines, growing need for targeted therapies, rising cancer incidence across the globe, and increasing collaborations and partnerships for companion diagnostics test development. 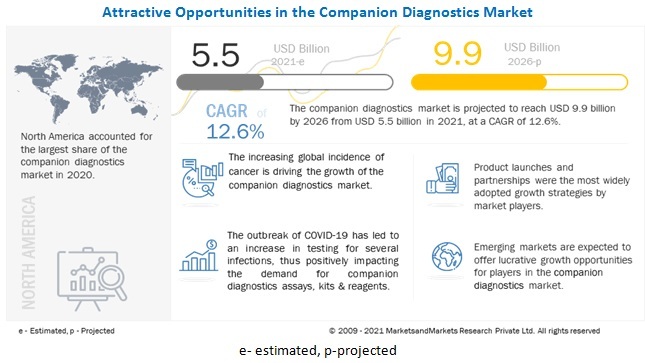 Rising adoption of companion diagnostics assay kits & reagents in major applications such as oncology, neurology are driving the growth of companion diagnostics market. Companion diagnostic assay kits include test panels that enable the detection of biomarker types. Companion diagnostics assays analyze the efficacy of a particular drug through the detection of disease biomarker activity against that drug. Companion diagnostic assays are operated on various technology platforms such as polymerase chain reaction (PCR), next-generation sequencing (NGS), immunohistochemistry (IHC), and in situ hybridization (ISH). Reagents include components such as staining solutions, acids, bases, buffers, detergents, solutions, and substrates required while performing various companion diagnostic tests. Reagents are products paired to the diagnostic test procedures and have a single-use. Companion diagnostics software is used to streamline the research and analysis of diagnostic results. Software offers various functions such as the identification of driver vs. passenger mutations, prediction of novel biomarkers, and identification of genes that cause cancer. Companion diagnostic services include the development and commercialization of companion diagnostic (CDx) kits, biomarker assay development, analytical and clinical validation, regulatory registration/approval, cGMP manufacturing, GCP/CLIA certified laboratory, and project management. There are many companies offering end-to-end companion diagnostic services from development to commercialization. Where will all these products & services take the industry in the mid to long term? What are the current industry developments for companion diagnostics? 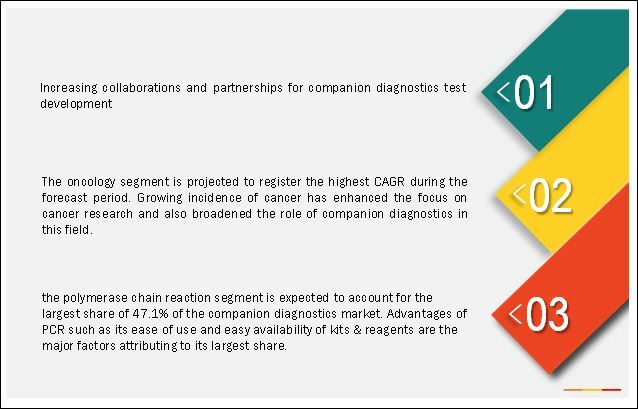 The prominent players in the global companion diagnostics market are Thermo Fisher Scientific Inc. (U.S.), F. Hoffmann-La Roche AG (Switzerland), Agilent Technologies, Inc. (U.S.), QIAGEN N.V. (Netherland), Illumina Inc. (U.S.). Collaborations and partnerships was the key growth strategy adopted by market players between 2014 and 2017. Companies also aim to differentiate themselves in the highly competitive global market by expanding their product portfolios in accordance with industry trends and client needs. *Top 25 Companies Analyzed for This Studies are - Abbott Laboratories, Inc., Agilent Technologies, Inc., Biomérieux SA, Danaher Corporation, Illumina Inc., Myriad Genetics, Inc., Qiagen N.V., Roche Diagnostics, Thermo Fisher Scientific, Inc., Arup Laboratories Inc., Sysmex Corporation, Hologic, Inc., Novartis Ag, Almac Group, Abnova Corporation Invivoscribe Technologies, Inc., Foundation Medicine, Inc., Biogenex Laboratories, Inc., Laboratory Corporation of America Holdings, Medical & Biological Laboratories Co., Ltd, Clarity Pharmaceuticals, Researchdx, Inc., Neogenomics Laboratories, Inc., Janssen Diagnostics, Siemens Healthcare Diagnostics Inc.
*Details on Marketsandmarkets View, Overview, Overview, Business Overview, Business Strategy Excellence, and Recent Developments Might Not Be Captured in Case of Unlisted Companies.